by Dave from The Longest Way Home ~ June 22nd, 2016. Updated on August 27th, 2016. Published in: Travel blog » Nepal. 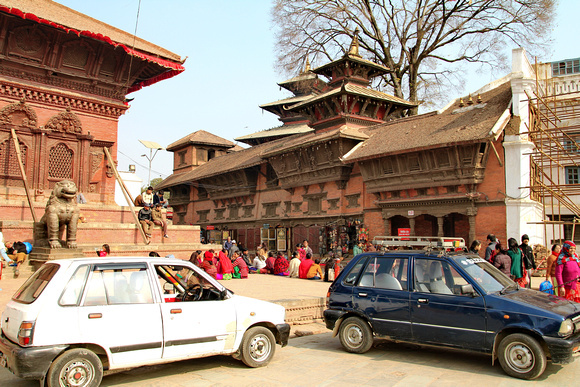 The main focal point of Kathmandu’s heritage and tourist attractions is its old historic royal square known as Basantapur or more popularly by tourism as Kathmandu Durbar Square. It’s the place where two small trading villages joined to form Kasamandap, Kathmandu’s first building. It dates back to the Licchavi period in the third century. It was and still is a public trading square for produce, work and business. It’s where Kathmandu’s living goddess resides. It’s where the tantric blending of Newari, Hindu and Buddhist beliefs all join together. It became the ancient royal capital of Nepal during the Malla era when the kings of the Kathmandu Valley battled to have the most beautiful city in the world and for royal power. A place where the Shah’s took over the royalty of Nepal before democracy came to light and the square became a living museum of the past and present. Kathmandu Durbar Square was and is the historic center of Nepal both in terms of cultural heritage, sovereignty, economics, religion and pride. 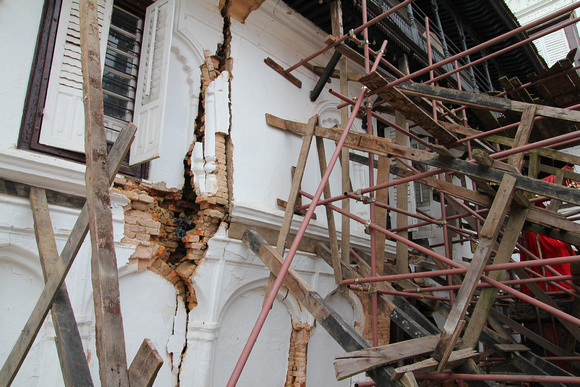 In 2015 the earthquake shook Kathmandu Durbar Square to its knees and tore down most of the southern section of temples and sent physical cracks of destruction throughout the remaining buildings. One would think this ancient square would have become the central focus for rebuilding the nation both physically and spiritually but also as a rising symbol of the nations pride in its past and its present. Nothing could be further from the truth. Kathmandu Durbar Square is an undeniable mess both physically and bureaucratically. What happened to make Kathmandu Durbar Square so bad? At the outset you might think that the 2015 earthquake was to blame for the ongoing destruction of Durbar Square. This is not the case. It has been damaged and rebuilt after previous earthquakes. The 2015 earthquake has only highlighted the real culprits of the modern era. 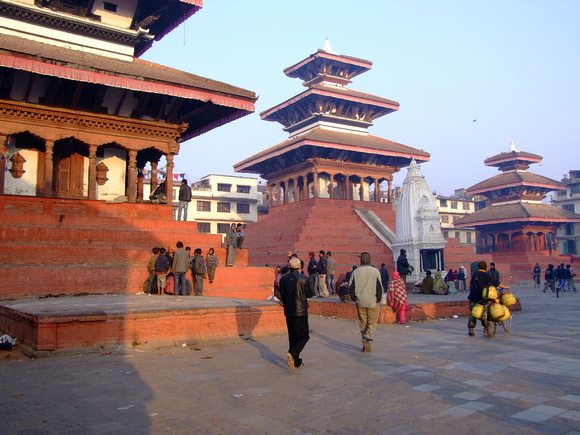 Let’s go back to the start of Kathmandu Durbar Square’s problems. After Nepal became a democracy new authorities were set up to look after the world heritage areas of Nepal. This is ground zero. While the Department of Archeology used to have near on full control it suddenly had to work with Kathmandu city municipalities and departments like the then Cultural Heritage and Tourism Department. To be frank – this was and still is the main problem. Kathmandu Durbar Square sadly found itself in a bureaucratic tug-of-war and became an entity that nobody really wanted to maintain but everyone had to have. 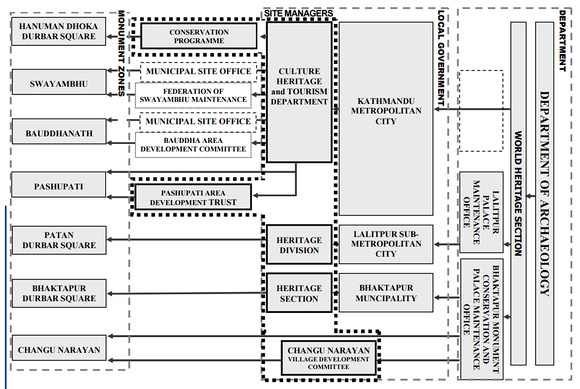 While the Department of Archeology set up an office in Hanuman Dhoka Durbar Square so to did the then Cultural Heritage and Tourism Department and the local Municipality. It’s hard enough to get one department working efficiently in Nepal let alone have three working together. And so Kathmandu Durbar Square basically stagnated for the next nine long years. Back in 2007/8 there was a 200 rupee (USD $2) fee for any “foreigner” who wanted to enter Durbar Square. Keep in mind that Durbar Square is a “public square”. So charging people to enter it is akin to charging a fee to enter New York Times Square, or Trafalgar Square in London or Plaza Mayor in Madrid. While the authorities claimed the fee was to help maintain the square others said it was because the square was a tourist attraction and people should pay. Both reasons didn’t hold up to international scrutiny. Maintenance of the square comes through the municipality and Department of Archeology who get funding through government coffers. Okay, so it’s a tourist attraction Well, so are the other international squares listed above not to mention just about everywhere else in Nepal or elsewhere in the world. It irks everyone to pay to enter a public building let alone a public square. If you want to use this central area to get from one part of the city to another you need to offer payment to cross over if you are not Nepalese. Being Nepal, this 200 rupee charge was pushed as a “token” gesture to help keep this ancient square maintained and in good condition. Being Nepal, most of us all nodded and smiled back before handing over this relatively small amount of change. Then, two years later, the fee went up to 350 rupees briefly (a few months) before being further hiked up to 500 rupees (USD $5). Rumors of bickering and disputes between the municipality and Department of Archeology over the running costs of the square were rampant. By now Durbar Square had become a popular choice for local taxis to park in among the temples that never even looked to get a lick of paint. Bring on 2011, the year of tourism, and the price was jutted up to a nasty 750 rupees with even more taxis, motorbikes, touts and crumbling rooftops present. I believe Kumari Chowk’s exterior windows had some black paint that year, the Narayan Temple (now gone) had some scaffolding put up around it and Maju Dega was white washed (bumper year!). Prior to post-earthquake renovation work beginning I saw two buildings get their windows painted just before the Indra Jatra Festival. At the end of 2015 the price was then hiked up to an outstanding 1,000 rupees (USD $10) for a visit. The reasoning? The earthquake had resulted in decreased numbers of tourists so they needed to increase the price to keep the place running. Numerous officials in Kathmandu Durbar square also agree that since the price hike to 1,000 rupees the complaints from tourists have been numerous. Okay, so the square had major damage and one needs the cash to rebuild … well isn’t that what this years American Ambassadors Fund of $320,000 goes towards. Ah wait, they’ve been doing that since 2001 with over $2.2 million already spent so it’s not new. 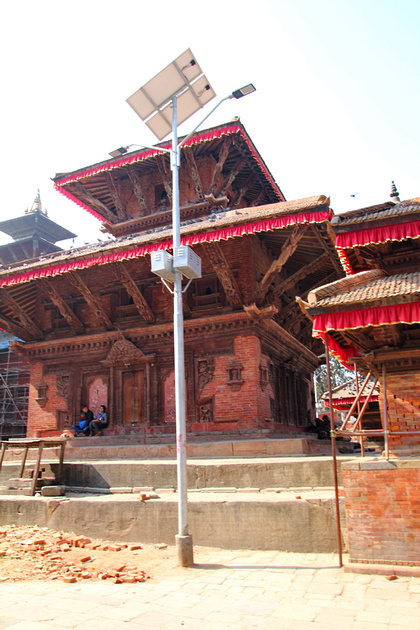 Just one of many funds like UNESCOs that help “maintain” Nepal’s Heritage sites. For sure there are no sour grapes when “western’ funding like this is used in conjunction with a 1,000 rupee entrance fee while SARC countries only pay 200 rupees to enter and dare I mention the Chinese now get free visas to enter Nepal too. It’s not just tourists who are suffering either. In 2016 local Durbar Square souvenir vendors say tourist numbers are down and so are their sales because of the entrance price increase. Kathmandu Durbar Square 2016 is a mess both in terms of repairs, maintenance, tourist hospitality, pricing and infrasturure. It’s mind-boggling to watch the decay of Kathmandu Durbar Square continue over nearly ten years. It wouldn’t be so bad if Bhaktapur Durbar Square and Patan Durbar Square had similar stories. But they don’t. The two other main squares in the Kathmandu Valley are very well kept, devoid of traffic and they nearly always have some form of maintenance visible. Both Patan and Bhaktapur charge $5 (going up soon) and $15 respectively. The latter encompasses a much larger area than Kathmandu Durbar Square. Then again let’s look at Panauti. A beautifully well-kept town of esteemed heritage that doesn’t charge anyone to enter it! By the way, here’s a list of temples destroyed in the Kathmandu Valley after the earthquake. Over the years I’ve watched Kathmandu Durbar square’s temples crumble away. I’m sorry but painting a temple is not full maintenance. Kathmandu Durbar Square has had an increasing number of taxis park in the middle of this historic and “protected” zone while other heritage zones refuse to let them in due to the damage they cause. Meanwhile “authorities” chase off local vendors from setting up shop on temple platforms yet they run away during major festivals when the platforms are dangerously overcrowded with people. The vast treasure uncovered in Kathmandu Durbar Square seems to have … well not been mentioned since it was discovered a few years back. Meanwhile it’s always interesting to watch the aggressive ticket counter security guards chase after tourists though always a little worrying as tourists tell them to go away as they often think of them as touts. Not surprising considering the touts in Durbar Square wear more badges than the actual staff! The lack of a public toilet is evident by the rank smell around King Malla’s column (now collapsed but still open as an unofficial lavatory it seems). The number of homeless people living around the temples is quite shocking. Part of this is due to their right for shelter at a temple. However one can’t help but wonder why all the international aid money to help these people is not evident here … Or at least part of the 1,000 rupee charge could be set aside to help people out. 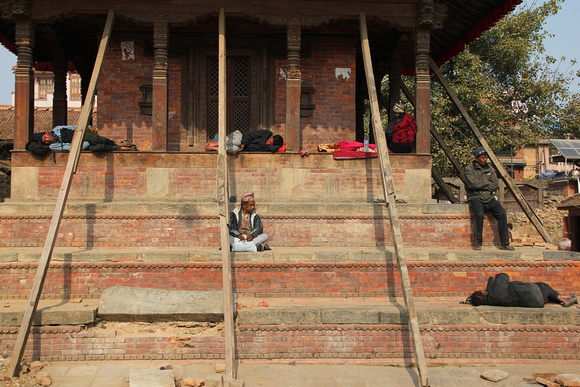 Then again, there’s a lack of homeless people in Bhaktapur Durbar Square and Patan Durbar Square … why? Gaddi Baihak (the white column building) has been noted as too damaged to repair and will be knocked down and rebuilt. Still, that doesn’t stop chunks of plaster falling down whenever it rains. One wonders if this is a cost cutting ploy to help bring it down or to bring in headlines when a brick finally hits someone on the head. Horrendous, and I do mean “horrendous”, stainless steel lamp posts have been placed around Durbar Square to light it up at night. Only the lamp posts are sensationally ugly which effects any photographs being taken of the remaining beautifully artistic temples. Seriously, would it have been too much to simply use wooden poles which would have at least fitted in with the overall design of the square? By the way (in case someone in maintenance is reading this), at least two of these “new” lights are already broken. Kasthamandap (the oldest in the square) after being completely destroyed in the earthquake was then discovered not to have any architectural plans to help rebuild it! An engineer from Europe donated his survey from the 1970s to help with this rather embarrassing situation. It doesn’t end there though as just recently those two wonderful of partners the city municipality and Department of Archeology have brought the whole possibility of reconstructing the building to a halt over a dispute on how to rebuild it. I guess it will come of no surprise to then learn of how the municipality, without notice, went about putting up metal poles and fencing around the collapsed temples. Aside from the damage caused by boring holes for the poles around the buildings they effectively blocked off religious sites that are used everyday! I might mention that all the pole driving into the ground happened soon after new underground structures were discovered in post-earthquake ground scans. Just to emphasis that in many Nepali religious traditions the building does not matter so much as the site does. So by fencing off these areas one is essentially stopping people from practicing their daily rituals and religious beliefs! This at least brought the ire of the local people who finally woke up and took them to task. The Department of Archeology also spoke up about this. Sadly, nothing that was done helped and the municipality finished fencing off “their” area of Durbar Square. I don’t hold out much hope for Kathmandu Durbar Square today given the past ten years and the non-changing efforts to make things better. It’s one of the reasons the Digital Archeology Foundation tries to preserve what’s left today, digitally. Because even without natural disasters Nepal’s treatment of Basantapur is ensuring it won’t be around much longer. There’s no doubt a tourist can still visit Kathmandu Durbar Square and find it incredible. Indeed both my Kathmandu city guidebook and Kathmandu Valley guidebook contain extensive information and maps that you won’t find anywhere else. I’ve also pushed hard to encourage tourists to visit the old city in Kathmandu (between Thamel and Durbar Square) with Heritage Walks in Kathmandu. They’re free and offer so much lovers of cultural heritage. In someways it’s more important to visit these places now, quickly. Because I really don’t think they will be around in a generation or two. About a year ago someone from a high ranking post in Nepal asked me to write some home truths about Nepal. I asked why when it was obvious what the problems were? They said they knew, but nobody “higher up” cares unless a “foreigner” tells them. So there you have it, some views over the years on the sad de-construction of Kathmandu cities national treasure. Many tourists and visitors to Nepal feel the same way. The problem is that they have nowhere to officially let their voices be heard. Someone could read the online forums, social networks and books all saying what we already know. Kathmandu Durbar Square is a mess, has lost its prestige and people are losing interest in it. But then that would take time and effort. A very sad state of affairs mainly due to too many meetings, bickering and greed. It wouldn’t cost a lot to photocopy some “feedback” forms and hand them out to tourists after they get their ticket. Then put up some mailboxes to place the completed forms in before they leave the square. It’s not a hard thing to do if you really want to know what we tourists think of Kathmandu Durbar Square. Who will take responsibility to do this though? The Municipality, Department of Archeology or even the Tourism Board. I know it’s none of their direct “responsibilities” but for goodness sake all it takes is one person with some photocopies to discover what the rest of the world already knows. 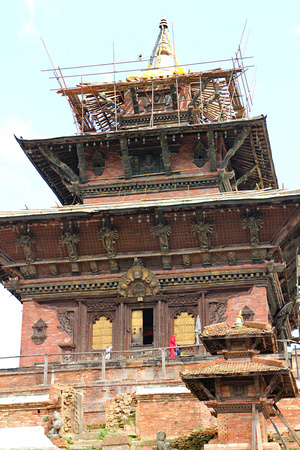 Your capitals national treasure of Nepal is very nearly gone and what remains is a mess. Very soon even the tourists will stop caring and visiting. Very soon your national treasure will be consigned to the pages of history. Then, your generation will have to bear the scars of history writing about you who neglected it. Get my latest Kathmandu Valley Guidebook to learn more about Nepal! I had similar thoughts about why this is a public square and we have to pay! It just shows the greed. If they want money make it free then charge for official guides, maps, and tours. I was there last October. They must have put the lights, price and fence up after that? Overall it was still an interesting visit. Was it worth 8 dollars? No. Not with all that traffic and the lack of sanitation. It speaks of Nepal. The capital square is so bad yet Bhaktapur and Patan squares are so much better. I hope people in charge of Basantapur take action on improving it, fast. I agree on this. Walked through last week with my ID and some man tried to grab my arm and make me pay. I showed my ID and we waved me on. Where’s the hospitality in that? The reports of such things are disturbing. Thank you for this type of writing. Love this site for just this. The real world and not a glossy magazine. It doesn’t change our mind about visiting Nepal. But now we learn about the heritage walks so we have more to see and do if we don’t like the square. Yes do please try the heritage walks in the old city. Saturday mornings are best. There’s a list of them in my guidebook. Nice bit of writing here. I really think the Department of Archaeology should maintain the square then have the tourism board run the ticket counters. Block the traffic. Clean it up. I would think at this stage only one organization should be in charge. Heritage before cars and profit. We were there a few weeks ago. It’s a shame things are like this. Aside from the earthquake damage the traffic was very bad. The touts were aggressive. The ticket counter girl actually told one to stop harassing us. Someone needs to do something about this. Why does the tourism board not help? Yes, many people have written to be about the aggressive guides and touts. It’s a shame the people in charge cannot control them! It’s sad to read about heritage sites like this being let down my the very people who are meant to be protecting it. I hope someone reads this and makes the square better. The “guides” are aggressive and put me off Nepal as a whole. One shouted at me for not taking his tour. I complained to the guy at the ticket office. He said they were not official guides. I said they had badges saying they were. He just said they were fake. How can you respectively have a fake guide beside an official tourist ticket office. Whoever is running this place is obviously getting a cut. Utterly ruined our trip to Kathmandu. I’m very sorry to hear about your experience. I would suggest that anyone having this problem report it to the Municipality office within the square – beside Kumari Chowk. I agree with every aspect of this. The fee is way too high. Get rid of these awful guides and taxis. Those street lights are terrible. Clearly this old square is being mismanaged. It should be declared a state of emergency and have whoever is running Bhaktapur come in and sort it all out. That simple. That might not be a bad idea! Why do the Chinese get a discount? Hasn’t most of the money to help this place coming from overseas come from the west? Having different prices for different nationalities is bigoted and to be frank racist. This is a question I’d asked myself. The Chinese are making deals with Nepal for the past number of years. I don’t know why they are getting preferential treatment. I imagine in the case of tourism this will come back and bite Nepal’s efforts as an international destination. Despite the damage from the earthquake, Kathmandu’s Durbar Square is still a great place to visit. I was particularly fascinated to see the living goddess Kumari. Entering her temple does require a paid ticket but it was worth that intriguing split second. Yes, Kathmandu Durbar Square is still a good place to visit for first time tourists as I wrote. Is it worth 1,000 rupees? That’s extremely questionable. Just to clarify, you do not need a paid or any kind of ticket to enter the Kumari’s house. It comes under the Kathmandu Durbar Square ticket price. 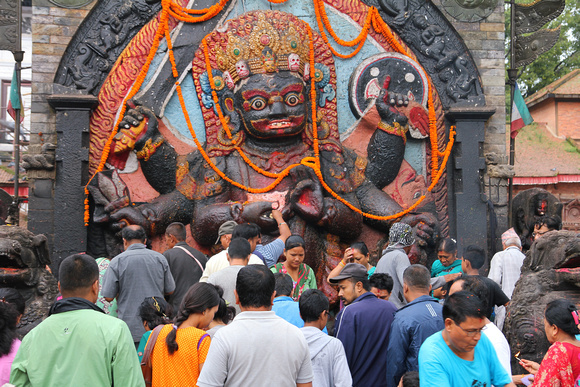 Likewise the one in Bhaktapur. The Kumari house in Patan has no entrance fee as it is outside of Patan Durbar Square. I do hope Nepal could recover from this situation! Their once proud heritage structures, I do hope they can recover them.